This is the first public discussion of Infobitt. You can now sign up for an account without an invitation. We’re starting a 100,000-person pledge drive: when we reach 100,000 pledges to add one fact, we’ll ask everybody to show up at once! We’ve also opened up our daily newsletter and have kicked off a discussion group. If you join, be forwarned, it’s a little buggy; you might have to refresh. But do join us! There’s a long version of this essay. I’m co-founder of Wikipedia. Now think back to a time before Wikipedia—the 1990s, if you’re that old. If you didn’t know the answer to a question, and a web search brought no joy, you might have to take a trip to the library, or stay ignorant. Today, if you don’t know the answer to a question, you can find one on Wikipedia within seconds. That’s a stunning development for humanity: we now have virtually instant access to answers. That’s a historical first. It changes how we learn, how we communicate, and how we think. How did it happen? Millions of people from across the globe understood the vision of a free, open content encyclopedia and acted on it. It was my job to organize this effort. Wikipedia was the result. 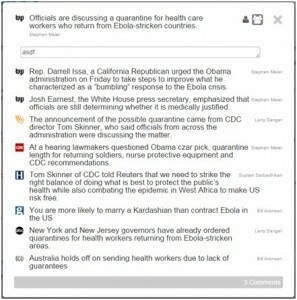 Now I hope to organize people to summarize and rank the world’s news in a free, open content news resource. The project is called Infobitt. It is human to want to know what’s going on. Perhaps billions of people follow the news every day in one form or another. This is why there are endless streams of news flooding the media landscape, more than ever before. Many of us would like to stay on top of the spreading pool of news. But the flood is getting deeper and wider. That’s why we skim various news sources, apps, our friends’ feeds, blogs, etc. We resign ourselves to not knowing many details; for that, we must read many articles in full. Only devoted newshounds have time for that. Beyond the sheer quantity of news, we must navigate redundant news, click bait, sensationalism, and on and on. The news has become noisy and confusing. There’s a sea of it, and it’s uncharted. The facts about an ongoing story are often spread across many different sources, from the New York Times down to a humble blog. Nobody organizes the facts. No media outlet has the motive or the ability to come to grips with everything. But we do—billions of us have that motive, and if we are organized in the right way, we’ll have the ability. What if we pooled our efforts on the news in the way we did on Wikipedia? Here’s the Infobitt model. We grab different facts from different news sources, summarize them in sentences which link back to those sources. We each drag-and-drop the facts into our preferred order, and the system calculates the sense of the community. The result is a bitt. That’s not all. There’s a stream of new bitts arriving in the system. We put bitts in order of importance by drag-and-drop as well. 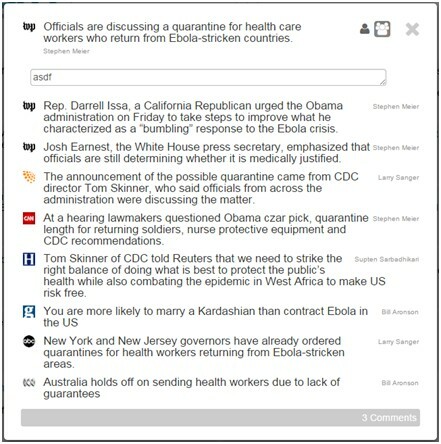 We’ve made a new way to collaborate on collecting the news. We want this done for every article about every story. And we want it constantly updated. After all, it’s 2014. Only a giant, international, online community could make this happen. This is citizen journalism re-envisioned to include an enormous distributed editorial function. It’s ambitious, but we can do it. The back end of the software isn’t simple; it has lots of interacting rules. To fund its development, we raised a seed round a year ago. The system, now in its second version, is easy and fun to work on. No invitation is needed sign up, but be forewarned, it’s under development; refreshing fixes some bugs. A small group of beta-testers have been using it for several months, and they regularly produce bitts and editions (especially the evening edition; subscribe here) of surprisingly good quality. We’ve opened a mailing list to discuss project policy. With just 10 times the number of contributors, the top stories would always be fresh and detailed; that wouldn’t be hard. We can do this! We’ll have to squash bugs and slowdowns fast enough, of course. We are looking for A-list web coders, so send us leads to awesome programmer who might be excited to work on a startup like this. We’re announcing a pledge drive. I’m asking you to pledge to add one fact to the system—just a sentence and a source URL. When we reach 100,000 pledges, then we’ll contact all the pledgers, and we’ll say, “OK, people, let’s get this party started!” Everybody converges on the website for 24 hours of fun, and our project really kicks into high gear. People used to tell me that Wikipedia would go nowhere. They were wrong. 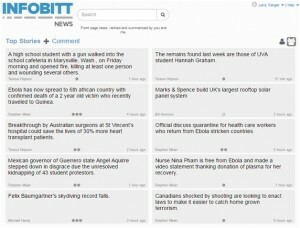 Infobitt too tackles a universal problem and requires an ambitious solution. We’ll inevitably have naysayers. But they’ll be wrong, too. The latent demand for this is strong, and a lot of people will naturally want to organize the news. We can do this. It’s potentially revolutionary whenever a bunch of smart people from around the world pool their efforts in making sense of information. We’ve done that with general knowledge. Now let’s do it with the news! What do you think of the idea? Let’s discuss below. Thank you for this! I have been advocating media reform for a very long time. Many things about our current culture need to change. Those needs are likely very different from person to person, but the conversations & cultural changes will begin only (in my opinion) with media reform. I believe this is the *true* baseline for change and your efforts are huge step in the right direction. While I don’t view myself as a fitting contributor, you have my support and patronage. Thanks again! I think Larry’s concept is a good one. However, I can’t help but think that it would be far more powerful if the Infobitts (for news) news concept offered the possibility of paying the editors for their labor. It seems to me, as wonderful as Wikipedia is – and it IS wonderful it would have been far more powerful if contributors had been offered an incentive to contribute even more; and I can’t think of a better incentive than money. My main worry: that interest groups take control of the system. Some time ago, Jimmy Wales responded harshly to people who wanted a less strict entry on homeopathy in Wikipedia, but unfortunately in the Spanish version all kinds of nonsense, pseudoscience, wild conspiracy theories, pseudomedicine and plain postmodern irrationality run rampant because a group of editors, firm believers in the paranormal and the alternativa regardless of evidence, patrol the site and avoid edits that would be too critical of their ideas, including homeopathy. They are people with time on their hands and a mission. At present, many news outfits are staking their traffic in distributing pure hogwash, be it the coming “three days of darkness announced by NASA”, the “discovery of Noah’s Ark” or “life after death confirmed by scientists”. These “news” pieces are being widely shared in social media by enthusiasts and scared disinformed people. If this project is to be in any way useful, it will have to manage this problem. Wikipedia in Spanish seems totally lost here, and is widely considered unreliable not only when it comes to science and pseudoscience, but also in other areas. I have been a constant critic of this. I would be very interested in a future Spanish development of Infobitt, (I am a translator and science writer) but only if the mechanism to avoid the hijacking by the tinfoil hat crowd is in place and works.